Picture of the State House from Beacon Street. 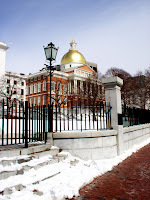 Designed by Charles Bulfinch, the State House sits on the south side of Beacon Hill, overlooking Boston Common and the Back Bay. The dome was coppered by Paul Revere & Sons in 1802 and was gilded for the first time in the early 1870s with 23 carat gold leaf for a cost of $2862.50; the most recent gilding, in 1997, cost $300,000.